Mango and avocado complement each other nicely in this delectable salad. 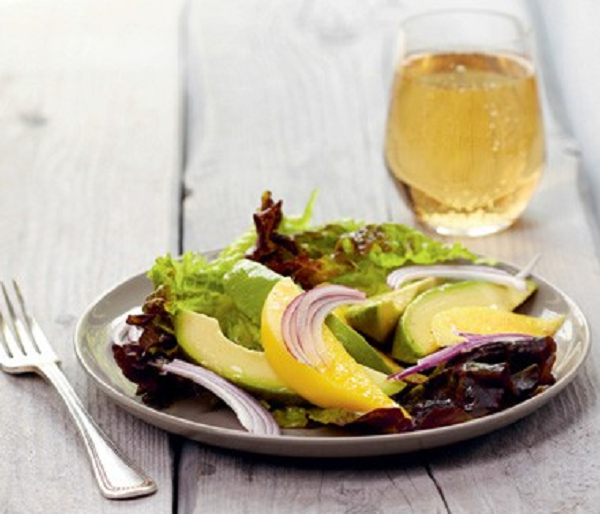 The avocado is blanketed with the vinaigrette while the mango adds a sweet contrast. If you aren’t familiar with mangoes, this is a good way to become acquainted. When ripe, they will be tender to the touch and will have a rose or yellow blush on them. Mangoes are abundant in tropical places like the Philippines. 1. To make the vinaigrette put the vinegar, oil, salt, and pepper in a small jar with a tight-fitting cover, and shake vigorously. Pour the vinaigrette into a medium bowl. 2. Cut the avocados in half vertically. Remove the seeds and discard. Insert the handle of a teaspoon between the skin and the flesh of each avocado and gently move it all around the circumference until the flesh is free from the skin. Slice each half into 4 lengthwise slices, then add the slices to the vinaigrette. Toss gently to coat well. 3. Peel the mango with a small sharp knife. The seed of the mango does not free itself from the flesh as the avocado seed does, so cut 12 lengthwise slices cutting toward the seed, then gently cut them away from the seed. 4. Lay 2 lettuce leaves on each of 4 serving plates. Remove the avocado from the vinaigrette and alternate slices of avocado and mango (4 avocado, 3 mango) on the lettuce leaves. Sprinkle on a horizontal row of the onion. Pour an equal amount of the vinaigrette over each serving. Serve immediately.